This episode is definitely another reference to "Brown Betty". Candy Man, a serial kidnapper who steals youth from kids to enable him to change from old to young, is back. This is upsetting to Colonel Philip Broyles as his son was one of Candy Man's victims. Olivia gets Christopher's help to save another little boy before it is too late. We got to see into Broyles family life like we did in "Earthling". Unlike his counterpart in the other universe, his marriage is very much intact. Yet there home is scarred by tragedy. Broyles is twice grateful for what Olivia has done to give them the peace of mind. Given the opportunity, I think Broyles would have let Liv go free. Let's start with some observations of Max Clayton's room. There are nine planets in the solar system as seen in the poster hanging on the closet door. Aside from the familiar Clue and Operation games and the book Burlap Bear Goes To The Woods, there is something I find very interesting. Quarantine Zone: The Board Game. On the box you can see this phrase. CAN YOU ESCAPE BEFORE IT IS TOO LATE? Olivia, who was becoming aware of her identity, intends to make a break for home. She needs Henry's help to take her to Liberty Island. But not before tackling one last case. Her work in this case remind me of the other Olivia, in "Immortality". It is easy to see through Liv the same dedication she has in her work. We have Diane's impression of her. More reasons that we should like the other Olivia. Olivia is captured when she attempted to cross back to the gift shop, because this was never her way home. The Secretary would not have facilitated her escape. I suspect the drugs he gave Olivia inhibited her ability from cross over for good. Remember the saying on the bubble gum wrapper "You can't get THERE from HERE." It applies in this case too. But she did manage to get the message to Peter. The prayer could be used to sum up the course of Fringe. Through pitch dark comes a cleansing fire. Through the fire, we shall find a spring of new life. Lincoln tries to cheer up Liv with Red Vines. "They're new." If there was a strawberry shortages, they are likely artificial in flavour. 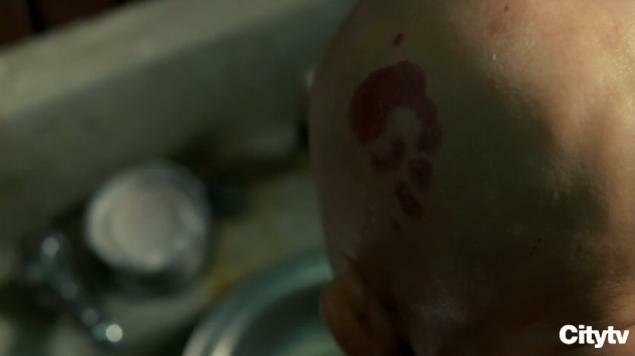 Olivia makes a connection to the Claus and Christopher Penrose case, suspecting Candy Man was stealing the children's pituitary glands to become young. Are we going to see reverse again in Season 4? Genius Walter has a genius for a son. I still cling to the belief that perhaps Peter is Walter's clone. Where is my age progression software? Fringe Events turned people towards religion, believing faith will heal their wounded world. It's a recurring theme. The scenes in Olivia's apartment. Come on, admit it. It was an awww moment. This phrase comes to mind. Ignorance is bliss. Bliss is where Olivia is right now. She had not known hardship like her double yet. Liv, Lincoln, and Charlie have no reason to question authority at this stage in the story. That's where they grow from. It begins in "Bloodline" for Lincoln and Charlie. For Liv in "6:02 AM EST". Olivia will see then The Secretary's true colours and choose to do the right thing. Liv: I thought you said it was a love story. Peter: Aren't all the best love stories tragedies? In the Clayton living room, there was a drawing of an airplane. They must have been as common as the airships once. The plane in the picture was depicted flying. What happened that we don't see them or have not seen them over there for over twenty-five years? Exhausted supply of fossil fuel to power them? Whatever the case, young Peter found a toy plane fascinating. Every kidnapping case is treated as a Fringe Event according to the Peter Bishop Act of '91. If Peter never existed, Fringe would not be called upon to investigate the kidnapping.